Oh, moi, ye, of little faith. The Ateneo Lady Eagles looked headed for a second successive defeat in the young but dangerously getting old in UAAP Season 79 when they came back from the dead to defeat Far Eastern University in five sets, 25-19, 24-26, 19-25, 15-11. A 1-2 standing is something that Ateneo, FEU, or in the case of 0-2 UST, can ill afford as National University, La Salle, and University of the Philippines all remain undefeated. You do not want to fall too far behind the pack with as many as six schools in the hunt for only four slots in the next stage of the volleyball tournament. FEU was eagerly looking forward to this match as there is a measure of unfinished business. When the two last met it was in the semi-finals of the previous V-League Collegiate Conference where the Lady Eagles defeated the Lady Tamaraws in two matches. 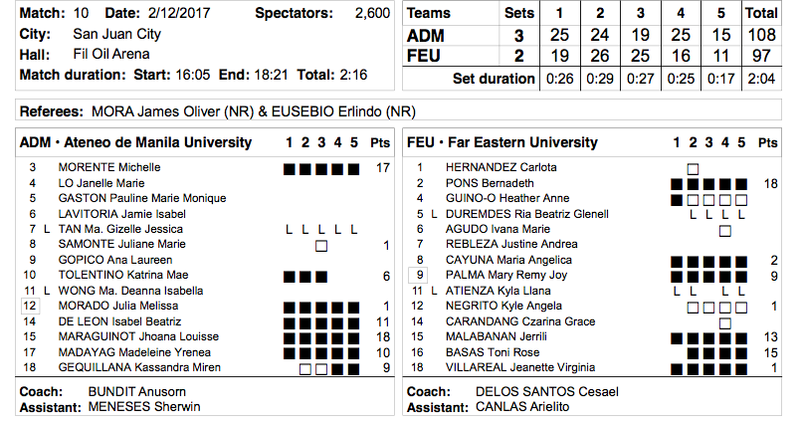 FEU somewhat seethed because in the preliminaries, they took down the Lady Eagles in three sets. When Bernadeth Pons went down with an injury, it was a telling blow to FEU’s title campaign. However, the composition of Ateneo was different then. Jhoana Maraguinot had yet to play (she did play somewhat sparingly during the finals versus NU). Maddie Madayag and Katrina Tolentino had yet to practice with the team after being felled by knee injuries. Mich Morente was just getting in the swing of things after a year’s sabbatical. Ana Gopico had an even bigger challenge after missing the two previous seasons of competitive play. One can say that the Ateneo coaching staff had its hands full. But even then, despite a patched up team, they made the finals and lost to NU in three matches. That said something about their potential. FEU in the meantime, put together a good team, one that could challenge after years of sub-standard play. Of course, Celine Domingo who suited up during the pre-season meant she would be unavailable as she served her one-year residency after transferring from UE to cross-street rival FEU. Let’s take a look first at FEU. As we wrote in the pre-season previews, they have depth and talent though they lack that requisite mental toughness born out of five-setters, come-from-behind and high-level games. You also have to hand it to their second year coach Shaq Delos Santos. Perfect demeanor for the team – teaches, guides, keeps calm, and well, exudes confidence. His willingness to try different players will help this team in the long run. I applaud his handing Gel Cayuna a big responsibility in leading the Lady Tamaraws. I always thought that previous starting setter Kyle Negrito lacked derring-do; creativity and an attack-minded mentality. While one may argue that Jia Morado isn’t one to send spikes down the middle like Cayuna or even NU’s Jasmine Nabor, no one can dispute her craftiness and game intelligence. Furthermore, Jia may not smack those balls over the net but she can sure drop them with the best of them. So when’s she’s in front of the net, opposing teams have to pay lots of attention to her. Shaq sending Ria Duremdes into the floor in place of Kyla Atienza who displaced her as the libero was a stroke of genius. I always thought that Duremdes could be an elite libero. 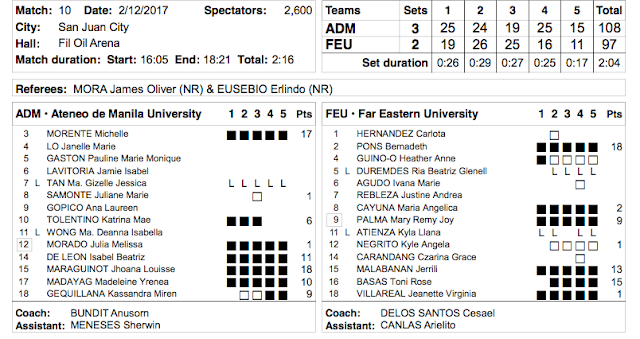 And for sure, she helped turn that one-set deficit into a one-set advantage for FEU, 2-1. I don’t think any one team choked. I thought that you really have to give it to both teams that really played great as they confounded defenses with off-speed shots, moving defenders around, and down-the-line attacks. Reception though is a different thing. For FEU, this is a disappointing loss. They really have to pick themselves up after this. And they’ll have to play a few more tough matches against NU, UP, and UST. And UE, their next opponent, isn’t going to be a walk in the park. Looking at the Ateneo Lady Eagles, they do have to mind the slow starts. While there is a saying that it isn’t how you start, it is how you finish. I’d like to point to Exhibit A – the four-set loss to NU as there was no start and no finish. You can get away with slow starts some of the time but not all the time. Talking to Ateneo Men’s Volleyball Coach Oliver Almadro, that was his team’s problem. This year, he has them taking fast starts. This five set win is huge. The Lady Eagles were on the ropes but they pulled out a classic come-from-behind win. I think that it is important to try other players. For all the talk of a deep and talented team, the coaching staff has stuck to a short rotation. While I like the trust the coaches give to the starters, I think letting them sit for a few minutes to gather themselves and take a look at the game from a distance gives them a different perspective. Plus, you will never know who can contribute. With Madayag and Tolentino playing major minutes, it has put Ana Gopico and Kim Gequillana on the bench. Ditto for Jules Samonte. While Gequillana knows that role, in the past years, she’s been that team’s fireman or firewoman to be exact. Her entry sparked the Lady Eagles. And rightfully, she was best player of the game. Reception is still spotty and while one can say that the Lady Eagles are a work in progress – and I will agree up to now – we are approaching the point of no return and no more excuses. On deck are the two underachieving squads in UE and Adamson. Perfect time to gain form and improve their defense before facing UP and La Salle to close out the first round. That is why this win versus for FEU is important. Adamson’s next.